ISM2016 is quickly approaching - just a little over two months away! As Diamond Sponsors of the premier supply chain event of the year, we're counting down to ISM2016 kickoff with a new podcast series. Listen to our experts discuss hot industry topics, providing sourcing best-practices, category management advice, and more in the Countdown to ISM2016 Podcast Series. 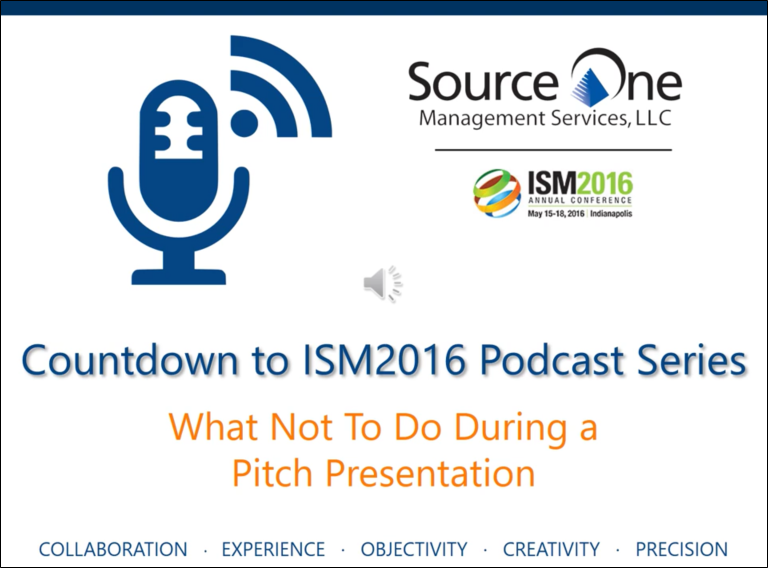 This week we launch the first of the Countdown to ISM Podcast Series with What Not to do During a Pitch Presentation presented by Source One Project Manager Tracey Horrocks. This podcast departs from Source One’s usual focus on helping Sourcing personnel run better events, and aims to help Marketing Agencies be better participants in the RFx initiative. For ad agencies, after making it through the RFP process, you are invited to present your capabilities to the key stakeholders of a prospective client. Now's your time to shine! Horrocks has participated in her fair share of agency presentations and knows what it takes to deliver a message that will impress your potential stakeholders. In What Not to do During a Pitch Presentation, Horrocks shares five tips to set up your agency for success during this crucial point in the relationship with the prospective client. This is just one of the many different topics many different topics Source One’s content series will cover to get you ready for ISM2016!